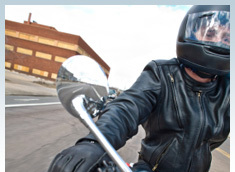 NH Motorcycle Injury LawyersHow Can Motorcyclists Protect Themselves Against Serious Injuries? Unlike drivers of cars, trucks or SUVs, motorcyclists do not have the protection of a steel frame, airbag or safety belt. Therefore, it is crucial that New Hampshire motorcycle riders ensure that they are taking the necessary motorcycle safety precautions to protect themselves against serious injuries. NH RSA 265:122 provides that no one under 18 years of age shall ride a motorcycle without a helmet. Carrying a passenger under 18 without a helmet is a violation level offense. The full statute can be found here: NH RSA 265:122. Even though New Hampshire law only requires minors to wear helmets, it is in the best interest of all motorcycle riders to wear protective gear. According to a report released by the National Highway Traffic Safety Administration ("NHTSA"), between 2005 and 2009, motorcycle helmets saved 8,328 lives. Motorcycle helmets also provide the best protection from head trauma or brain injuries for motorcyclists involved in traffic crashes. The NHTSA has found that the passage of helmet use laws governing all motorcycle riders is the most effective method of increasing helmet use. When you choose a helmet, it is important that you pick one that is approved by the Department of Transportation ("DOT") and make sure that it fits snugly on your head. It is also important that it has a face shield. The protective gear worn by motorcyclists is the only defense they have against injuries in a crash. During a collision, riders are often thrown from the motorcycle. Heavy-duty protective riding gear such as leather jackets or pants and boots can help minimize serious injuries such as road rash, which can be extremely painful and could take a significant length of time to heal. Safety gear is designed to protect you in the event of a crash. The NH motorcycle lawyers at Tenn And Tenn, P.A. encourage all riders to wear appropriate riding gear. And, if you are injured in a motorcycle crash due to someone else’s fault, call us. Our motorcycle injury attorneys have been proudly representing bikers for the past 20 years.